Decades after my father was first exposed to asbestos, we discovered he had contracted pleural mesothelioma. The pain of losing him was unbearable. In my opinion, no other heartache compares to losing someone you love. That deep-rooted pain sent me reeling into the depths of depression. It kept me locked in its darkness for more than a year until I began to forge relationships with new friends. That’s when a faint light appeared in the blackness. My despair grew brighter when I started helping my mom clean the house, performing minor home repairs and handling all the yard work. I soon realized that helping her served as my own therapy. Aiding my mother through this personal tempest helped clear my inner storm. At the time, I had no idea why helping her made me feel better. I thought perhaps it had taken my mind off my own sorrow, but there was much more at play. Scientific research supports the notion that helping behaviors can cause people to feel better about themselves. Psychology professor and author David Myers, of Hope College in Michigan, says many of us face trials in life that leave us feeling down and depressed. Experiencing the death of a loved one can amplify these feelings of distress immensely. When our mood is negatively affected, finding a way to help someone else can neutralize those negative feelings. Feeling better emotionally is an important step in healing from a loss. 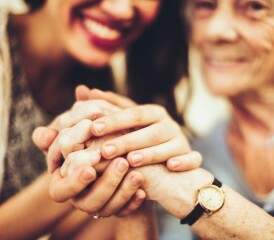 Stephen G. Post, director of the Center for Medical Humanities Research at Stony Brook University in New York, says acts of kindness can improve your health. Feeling better inside and out is a big part of picking up the pieces of your life when tragedy hits. Participating in acts of altruism can make anyone suffering with sadness, depression or any negative feelings that affect mood feel better. Myers notes that a person who is experiencing profound grief cannot freely give of themselves during their moment of distress. If a person is experiencing the loss of a spouse, parent or someone they were extremely close with, the grief can consume them for some time. During this period, it is important to remain focused on spending time with loved ones and participating in daily activities. When people begin collecting their thoughts, helping behaviors can open healing doors for them. A serious diagnosis can be life changing, especially one that requires immediate and frequent medical attention. It can create feelings of sadness and depression, too. The key to participating in helping behaviors following that kind of diagnosis is to choose activities that will not be physically overwhelming. When you’re ready to help, take a moment to consider the skills you have to offer and how you can use them to benefit others. Think about all the different ways you could help people with their physical and emotional needs. Dr. Richard Curwin, an award-winning author and educational speaker, proposes a system for molding altruistic acts for individuals. Curwin first suggests selecting necessary activities. For example, you may choose to help in areas where your assistance is truly needed, a homeless shelter, faith-based programs for the needy or afterschool programs. Another suggestion is choosing activates that match your ability. If you are great at cooking, perhaps volunteering in a soup kitchen would be best. If you are great with tools, maybe a carpentry assistance program would be the right choice. He also states that it’s important to not force a person into helping others. If the helping behavior is forced, the benefits are lost. People are not limited to serving in soup kitchens or working on a church building project. Altruistic acts can be any motive to increase the well-being of another, without conscious regard for oneself. Even a small act of kindness, such as paying for the driver behind you in the drive-thru line, can have emotional benefits. The point of engaging in helping behaviors is to transform your own personal tragedy into a story of kindness. It does feel good to help someone else, even if there is no reward or repayment. My father always told me I would never go wrong when helping someone else, and in the whirlwind of his death, I truly learned what he meant. Helping my mother made me feel good. I felt that I was helping her find the light at the end of her tunnel of grief, and our home looked nice in the process. When I would clean the house or mow the lawn, I felt better. I was keeping busy and healing from within. Myers, D. G. (2010). Social Psychology (10th ed.). The University of Phoenix eBook Collection database. Post, S. G. (2007). Altruism and Health: Perspectives from Empirical Research. Oxford University Press.